Do you ever feel like no matter what you do life, is always presenting pebbles, rocks and sometimes even boulders? Have you ever wondered why some people seem more at ease and at peace, while others struggle with challenge after challenge after challenge? Life is an experience in ALIVENESS! It's about building STRENGTH and engaging PERSEVERANCE as we walk through the challenges of life being and knowing our souls experience. Life requires whole-hearted commitment - moment by moment, inspiring authenticity and integrity to Self. We live in the awareness that we are awake and asleep. Both are our responsibility. 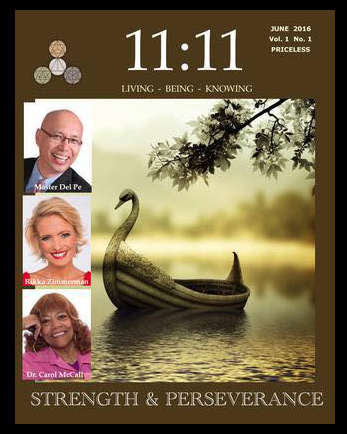 My friend, Love Catalyst and Rebel Humanitarian - Simran Singh, has released the NEW issue of 11:11 Magazine - STRENGTH & PERSEVERANCE. 11:11 Media's mission is to empower a new world experience of ALIVENESS, while bridging the experience of humanity and divinity. I invite you to enjoy this integrative, award-winning, FREE online publication devoted to life enhancement and empowerment for all people, and the 20 beautiful voices (including mine) of wisdom shared within. * Access information here to participate in 'The Genius in YOU' weekend group event July 15-17 in Blairsville, Ga.
* Tuck YourSELF Away Retreats : Come Home To Your SELF....Schedule your own personal Golden Pathway Retreat of Self-Love, Self-Illumination, Self-Mastery and Self-Design. * For an immersion into your own personal 'Mystery Experience Weekend' (Aug. 19 or Sept.30) and to initiate your voyage of Self-Illumination with Simran and Tuck, contact Simran at Simran@iamsimran.com or Tuck at Tuck@TheRebelBelle.com for information.